Florham Park, NJ – The 2018 NFL Draft was regarded as the best quarterback draft class since 2004 which included Eli Manning, Philip Rivers and Ben Roethlisberger. During the 2018 draft, fans witnessed teams select a quarterback that would either become the starter on day one or sit behind an already seasoned quarterback to learn from with hopes they will take the reins in the future. Currently, five quarterbacks from last year’s draft are starters in the NFL this season. The New York Jets selected Sam Darnold out of USC with the third overall pick to become their franchise quarterback. Here is a look at how Darnold and the other rookie quarterbacks have performed so far this season. Sam Darnold’s rookie season can be described as having a fair share of ups and downs. He was the first rookie quarterback to be named a starter this season, starting in week one against the Detroit Lions. His first pass was pick-six to Quandre Diggs. But as all the best quarterbacks do, he shook it off and finished the game 16 for 21 with two touchdowns and 198 yards. The Jets would win 48-17. He would struggle in his next three games but during weeks five and six he was able to put in solid performances helping the Jets earn their second and third wins of the season. During those games, he combined for five touchdowns, two interceptions, and completed 34 out of 52 passes. Unfortunately, the Jets next three games were losses and Darnold had not completed any game with a completion percentage over 55%. He combined for two touchdowns and seven interceptions, before sustaining a foot injury that kept him sidelined for a month. With Josh McCown now under center, the Jets lost their next three games and the only thing the Jets hoped for was that Darnold was learning from watching veteran McCown on the sidelines. Darnold returned last week for a divisional showdown with the Buffalo Bills and helped lead the Jets to a 27-23 win, their first victory since week six over the Indianapolis Colts. The Jets are 4-9 so far this season and face the Houston Texans, the Green Bay Packers and the New England Patriots in the next three weeks. These are three formidable opponents which will be a great test for this rookie quarterback. The Jets will not make the playoffs, but having their rookie quarterback back under center and continuing his development should be a priority until the season ends. It gives them something to play for and a piece of hope to hold on to for next season. So far this season, Darnold has a completion percentage of 55.9%, 12 touchdowns, 15 interceptions and 2,104 yards. Baker Mayfield was selected by the Cleveland Browns with the first overall pick in the 2018 draft. The Browns may have finally got one right. With the Texas Tech Raiders, he became the first walk-on true freshman quarterback to start a game at the BCS level in 2014. He transferred to Oklahoma and for three seasons was amazing for the Sooners. He won the 2017 Heisman Trophy as well. Everyone knows how difficult it has been for the Browns to find a franchise quarterback, especially through the draft. They’ve drafted multiple players that haven’t panned out including Tim Couch, Brady Quinn, Brandon Weeden and Johnny Manziel. There was no doubt there was pressure on Mayfield but so far he has been that shining star. 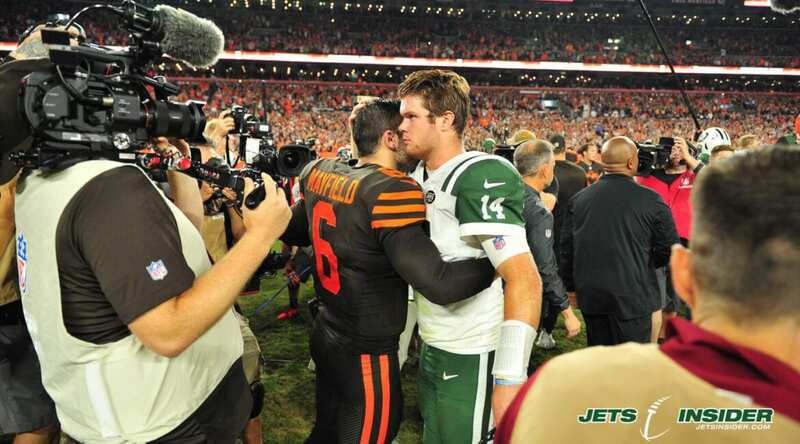 Mayfield first saw action against Sam Darnold and the Jets during week three. 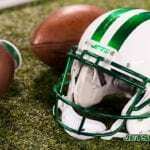 After Browns quarterback Tyrod Taylor suffered a concussion, Mayfield was thrown into the fire while the Jets were leading 14-0 and led a come from behind victory, giving the Browns their first victory in 635 days. Since then, Mayfield has started every game for the Browns posting a 4-6 record at the helm. In only one game this season, he has thrown for less than 200 yards and had a completion percentage below 50%. The Browns own a record of 5-7-1, which is an improvement on their past three seasons. Mayfield has completed 64.4% of his passes, 19 touchdowns, 10 interceptions and has racked up 2,877 yards. His completion percentage, touchdowns thrown and yards gained lead all rookie quarterbacks. It looks like the Cleveland Browns finally got it right. During the middle of the 2017 NFL season, Josh Rosen was the projected to be the number one overall pick in the 2018 draft. Obviously, draft boards and mock drafts change each month leading up to April. Rosen was a junior at UCLA and was portrayed as an arrogant and uppity kid, who thought he was the best player in the draft. He finished his junior year with great, but not ground breaking, numbers. On draft night, Rosen was selected 10th overall by the Arizona Cardinals. He voiced his disapproval that night and vowed to show teams were wrong for passing him up. He started the 2018 season on the bench behind Sam Bradford. But Bradford struggled through the first three games of the season and Rosen would make his NFL debut on week three against the Chicago Bears after Bradford was benched. In the contest, Rosen was four for seven with 36 yards and one interception. With about a minute left and Arizona down 16-14, Rosen threw an interception while his team was at the mid-point of field. The interception clinched a victory for the Bears. It’s no secret that the Cardinals have struggled this season and it hasn’t been easy for Rosen. In a game against the Denver Broncos, he threw two pick sixes in one quarter and the Cardinals lost the game 45-10. His record as the Cardinals starter is 3-7 and he has completed 60% of his passes in only three games this year. Rosen has thrown for 1,910 yards with 10 touchdowns, 12 interceptions and has a completion percentage of 55.4%. Josh Allen was another highly touted prospect for the 2018 draft. His height (6’5) and weight (237 lbs) are very ideal for a quarterback. Out of all the prospects, he definitely had the strongest arm but the one thing that was a concern was his accuracy. In his sophomore and junior seasons, he finished with 56% of his passes completed. He was chosen with the seventh overall pick in the draft by the Buffalo Bills. Drafted out of Wyoming, Allen would be staying in his element of cold weather. In the Bills first game of the season, Nathan Peterman was the team’s starter but while they were getting blown out 47-3 against the Baltimore Ravens, Allen came off the bench and made his debut finishing the game six for 15 with 74 yards. He would take over as the starter the following week and in week three against the Minnesota Vikings would earn his first win with a 27-6 victory. Allen would miss extensive time during the season with an elbow injury but returned in time for the Jets-Bills rematch this past Sunday. Allen and the Bills fell to Sam Darnold and the Jets 27-23. So far this season, he has a completion percentage of 52% along with five touchdowns, nine interceptions and 2,429 passing yards. He has had the most success scrambling and running with the ball to gain positive yardage, despite his size. He has 66 carries for 490 yards with five rushing touchdowns. Though his accuracy still seems to be problematic, carrying the ball seems to work more for Allen. Against the Miami Dolphins in week 13, Allen rushed for 135 yards which broke a Bills franchise record for most rushing yards by a quarterback in one game. During weeks 12 through 14, Allen broke two records. He was the first quarterback ever to rush for at least 95 yards in three consecutive games and had the most rushing yards by a quarterback in a three game span with 335 yards. Who knew this kid could be such a dual-threat? Lamar Jackson is the last quarterback to end up on this list. Jackson played for the Louisville Cardinals for three seasons putting up solid numbers in both the passing and rushing game. He won the Heisman as a sophomore in 2016 and wasn’t as hyped up as the previous members mentioned. The Baltimore Ravens traded up to select Jackson with the 32nd pick of the draft. Jackson first saw action during week one in a 47-3 blowout game against the Buffalo Bills. He relieved starter Joe Flacco and finished the game one for four with 25 passing yards and 39 rushing yards on seven attempts. In the coming weeks, Jackson was used in trick plays and wildcat plays but would not have much playing time at the quarterback position. His first start came against the Cincinnati Bengals in week 11 when Flacco was sidelined with an injury. He finished the game with 150 passing yards and a 68% completion rating and 119 rushing yards on 26 attempts. He is currently the starter for Baltimore with a 3-1 record. His first loss came this last Sunday against the powerhouse Kansas City Chiefs. The Ravens are battling to maintain the second wild card spot in the AFC and with Jackson starting may even take over the division. This season he has a completion rating of 58%, 687 yards passing, four touchdowns and three interceptions. He has also rushed for 475 yards on 95 attempts with three touchdowns. Former Jets quarterback Michael Vick has called Jackson “a spitting image of me.” To receive a complement like that from arguably one of the greatest mobile quarterbacks should mean the world to Jackson. It will be fun to watch his development and see if we really have another Michael Vick in the NFL.